Smells like: A summer's night during an evening storm. Alsayr resembles a Morgan in build, strong but not bulky. Her skin is smooth, covered in soft, fine hair the color of a stone wet with rain; her hooves are identical in color. Her eyes, when uncovered, are blood red with typical black pupils; the red matching the fabric adorning her and sheltering her eyes from the sun’s light. This garment serves a dual purpose; protection from the sun should she awaken during daylight hours as she suffers from extreme light sensitivity and of course, it demonstrates which tribe she belonged to and her status within it. This crimson cloth is wrapped securely around her face before falling away to drape across her neck from the part between ears, as well as from the muzzle end of it. This then crosses over her withers to end wrapped around each foreleg, the left side higher than the right. Another set of cloth in the same bold shade lies across her lower back to extend down and wrap around each hind ankle. 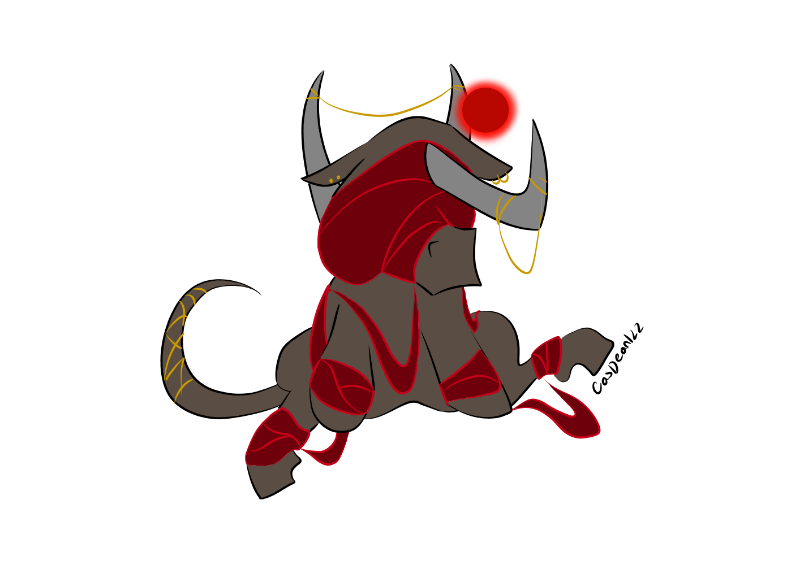 Due to the nature of her desert homeland, she does not have a mane, instead twin horns curl upward towards each other from the sides of her neck; a thin gold chain binds them to one another. Her forehead is adorned with another horn that juts straight from her forehead before turning at a ninety degree angle towards the skies; it too bears a slim chain of bright gold wrapped around its base, draping towards the earth, and reconnecting towards the tip. A third chain is wrapped around her reptilian tail, approximately halfway down its length which is longer than typical tails; it too is composed of skin covered in fine hairs without the lengthy locks most equine bear. 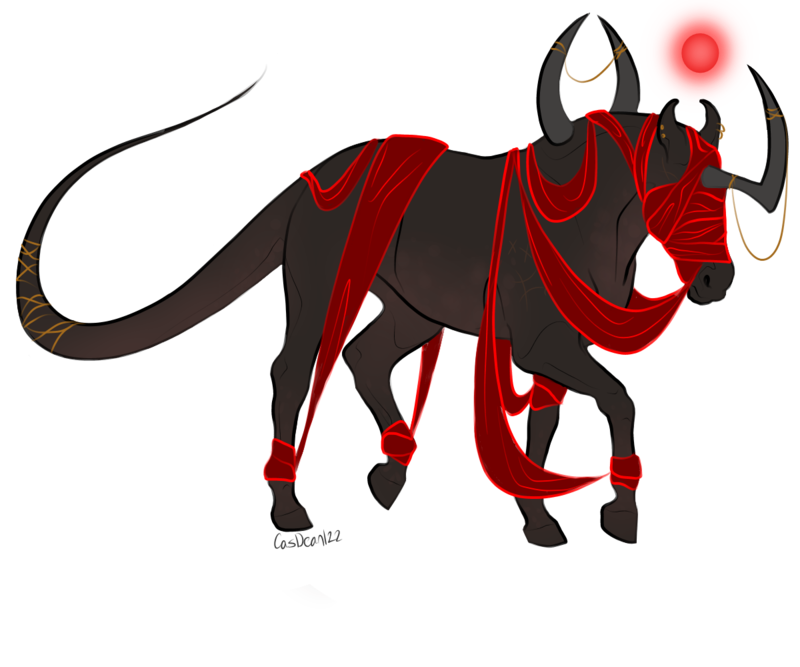 Between her ears hovers a glowing red orb, it serves no purpose other than to light her path when the night is too dark even for her enhanced night vision. Lastly, her ears which curl towards each other, are decorated with gold earrings; the right with two simple studs and the left with twin hoops. Alsayr is slow to trust due to the betrayal which wiped the vast majority of her people from existence, but displays no bitterness towards strangers. She is incredibly protective of those she cares for as well as any who hire her for her abilities as a shield; which the lack of upon entering Fim leaves her angry and feeling vulnerable. This increases her distrustful nature and will often seclude herself in an easily defendable position that does not see full sunlight at any point of the day should the need arise to awaken and defend herself. Despite her obvious light-induced disability (made worse without her magic to protect herself) she remains quite independent and is not easily persuaded. Alsayr also has a rather serious nature, not aloof or disdainful, but she carefully examines all who cross her path with a critical eye; she does enjoy a good laugh now and again as well. Alsayr was born to a nomadic desert tribe, all of whom suffered from day blindness; a condition which left them nocturnal and incredibly vulnerable during daylight. The elders of the tribe, because of this, hired another trusted tribe to watch over them while they slept; a favor they returned during the night. Their guardians betrayed them in favor of a better barter with an enemy group and they were slaughtered in their sleep. All of them were killed except for Alsayr and the three sleeping closest to her; a magical gift waking in her time of need. A shield surrounded the four of them, concealing their location and any who wandered closeby were subconsciously redirected another way. When nightfall came and blood coated the earth in every direction, they braved separating to look for survivors; the horrors they witness forever etched in the recesses of their minds. Upon finding no one else spared from the massacre, they decided to split up and attempt to locate one of the other tribes friendly to them in hopes of sheltering with them. With promises of sending word should they reach a friendly nation, the four parted ways, three of them nervous without Alsayr’s strange magical gift to shield them during the day. She never heard from them and after a year, on her fourth birthday, she decided to stop trying to locate the group she was supposed to. Instead, she turned her attention to any willing to fulfill her basic needs in exchange for infallible protection at night. For warm shelter, an endless supply of nourishment, and peace, she guarded whomever she struck the deal with until her contract ended or the danger passed. Eventually, she came across a client who did not seem to understand that had no interest in a more physical relationship during their time together. As with all her clients, she followed them wherever they went, including remaining in their bedchambers while they slept. Her last contract ended when the noble she guarded could no longer had a desire to keep his hands to himself and she used her shield ability against him; to his utter surprise. His actions violated the contract drawn between them and his quick death after the withdrawal of her shield held no repercussions for her. Nevertheless, she left that town and traveled for a month or so before stumbling across a rather large and foreboding tree. Apprentice: At this level she can protect anyone she is in physical contact with, up to two others, from any physical or magical attack; it also redirects any who attempt to breach the shield. She can do this indefinitely, however, should they break contact they are instantly vulnerable until contact is resumed. Adept: Her patience at recovering her arcana is rewarded, at this stage she can protect anyone within a five-foot radius without physical contact. The effort of holding the shield without touch is greater and she will suffer nosebleeds once the magic is dropped. The redirection effect remains with an added perk of reflecting any arcana or physical attack against it; because of this it cannot be nullified. Master: Time and practice have paid off. Alsayr can wield this shield with ease and at greater distances including not needing to be near those she wishes to protect (only needs visual contact). If held for great lengths on more than three others it will leave her with nosebleeds once the shield is dropped. The reflection caused to those who attempt to gain access to her shield is increased and the unprotected may suffer bleeding from their noses and/or ears should they persist in their efforts. Virtuosos: The ability to redirect those who attempt to breach the boundary is heightened by shielding those within from sight, rendering any she seeks to protect invisible. The shield itself becomes even easier to bear and she can keep it active for an indefinite length of time without consequence. The reflection aspect of her skills remains in place but the consequences to the persistent are enhanced to include a migraine along with the bleeding from noses/ears.